Just where will 68 kilobytes of computing power and an analog record get you? To quote Buzz Lightyear: "To infinity and beyond!" That very well could be Voyager 1's motto. NASA scientists confirmed today that the Voyager 1 space probe has become the first human-made object to leave the solar system and venture into interstellar space.Voyager 1's precise location has been one of the most hotly debated scientific topics of the past year. Has the intrepid probe finally left the solar system -- or is it just on the edge? Experts have gone back and forth. When you think about the incredible 12-billion-mile trip this little spacecraft has taken since it was launched in 1977 -- with '70s technology -- it is a testament to American ingenuity and engineering. Voyager 1 has gone where no spacecraft has ever gone before, rocketing through space at 37,000 miles an hour. But now the spacecraft is so far away from Earth it takes 17 hours to phone home. "The science we will get back from Voyager will change what we know about the universe, simply because we know so little beyond our solar system. We haven't been there before," said David Alexander, who heads Rice University's Space Institute. 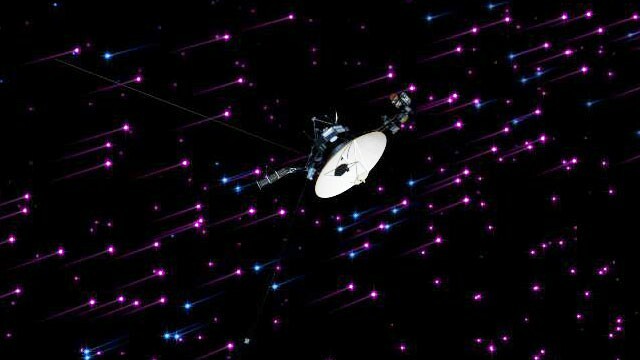 "The science we will get back form Voyager will change what we know about the universe." Voyager 1and its sister ship, Voyager 2, have defied the odds. Their missions were programmed for five years, But remarkably, 36 years later, they are still zipping through space, going where no man, or machine, has gone before. What made these missions successful was the planning that took advantage of an extremely rare (once every 175 years) alignment of the planets -- taking the spacecraft on a four-planet tour of Jupiter, Saturn, Uranus and Neptune. Alexander also gives NASA credit for extending support to the spacecraft on its initial mission. "NASA listened to the scientific community and figured out a way to optimize their performance to keep them going further," he said. So much for planned obsolescence. The Voyager probes may keep going like the Energizer Bunny, unless they meet some catastrophic fate. "Probably only if they collide with a UFO," Alexander joked. If Voyager does encounter alien life, it is equipped with a gold-plated record with images from Earth and greetings in 55 languages in search of a civilization that hasn't gone digital yet. Buzz Lightyear would be proud.